Priya has been a very enthusiastic participant in all my egg substitute events month after month. I think she has sent at least 30 entries so far. I can never match her contribution but I wanted to send at least one or two for her events. This month she is hosting the Microwave Easy Cooking – Snack event. I really don’t use the microwave oven that much. I heat water and I cook papads in it because we don’t deep fry it. Initially the microwaved papads didn’t suit my taste (being so used to the deep fried ones) but now have got used to it. Another little trick is I spray the appalam or the finger chips using non stick spray and then cook it for a minute in the microwave oven. This tastes really good. I didn’t know what to send for her event. Then only I remembered my mom preparing okra (ladies’ finger in India) fries in the microwave oven. 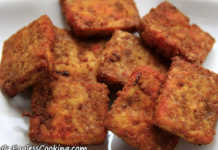 The original recipe is my grandmother’s but she deep fries it in oil. So I decided to prepare my mom’s version. I have done it with tindora (kovakkai) but not okra. The only difficult part in this recipe is cutting the okra. You would have to cut a big batch of okra because when cooked the yield is very little. My son was relishing these fries like he would devour potato chips. It’s irresistible for adults as well. I prepared this as side dish for our lunch but we snacked so much that we didn’t have much to have with rice. One disclaimer though, I don’t know much about microwave oven settings. The time I have given is based on my oven. So try with small increments of time with the first batch, stir it in between and proceed further. Also note that I used 2 pounds of okra, but the measurement is given only for one batch. So use seasonings accordingly. Who doesn’t like tasty yet fat free and crunchy snacks? If you are one, then you should try this roasted chick peas recipe too the next time. You won’t be disappointed. Wash and dry the okra. Discard the top and bottom of the okra. Cut it lengthwise. Again split each half lengthwise. So you would have 4 finger like pieces. If the okra is big cut the pieces half midway (so 8 pieces from each okra) or use it as it is. Transfer the okra pieces to a bowl. Add oil (if using) or sprinkle very little water so that the seasonings would stick to the okra. Then add all the other ingredients and mix it thoroughly with your hand. Make sure the plate in the microwave is clean and place the seasoned okra on it directly. First I set the time for 5 minutes. Stirred it and cooked it for another 2 minutes. Be careful while stirring because the plate will be hot. Microwave oven settings vary, so chose the time considering the type of oven you are using. From then on I increased the time by 30 seconds each time until I got the crispy texture. Don’t forget to stir after every 30 seconds. I did like this thrice. Be alert or else it would get burnt. Taste it after a standing time of 1 minute. You would be floored by the crispiness. Repeat the same for rest of the okra. First I did it with oil and then tried it with water. Both taste the same if consumed immediately, but the one with water becomes a little chewy after a while. I resisted my temptation to chow down everything to see how it fares after sometime. It stays crisp at least for 2 hours but becomes chewy later. Wow – these look yum, looks like a quick dish to make than the subzi. Is it the same concept for low-cal potato chips except for the flour? That was really fast. thanks very much for your reply. Will try this one. Can I bake this in a conventional oven? Do you think the result will be the same? You could Chithra. You can also bake plantain chips, bittergourd chips in the oven, but the only drawback is it takes a lot of time and electricity. You have to preheat the oven first and then bake somewhere between 15-30 minutes depending upon the type of vegetable you are using. THANKS SO MUCH I FOUND OUT ABOUT YOUR WEBSITE JUST YESTERDAY AND I AM SO THRILLED I CAN TRY OUT DIFFERENT DISHES AND I WANT TO MAKE IT A POINT TO VISIT YOUR WEBSITE EVERYDAY I AM SO EXCITED AND THE RECIPES ARE QUITE EASY AND THE INGREDIENTS ARE WHATEVER WE USE EVERYDAY ALMOST EXCEPT I HAVE TO BUY SOME INGREDIENTS THANKS SO MUCH AND ALL THE BEST!!!!!! Thank you so much for your generous compliments Savitha. Do try the recipes and get back to me if you have any specific questions. 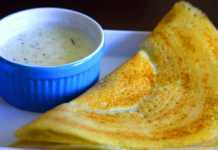 Excellent recipe – I was initially apprehensive about the Bhindis turning crisp in the micro- but I just tried a small portion before preparing it for dinner.Thank you so much.. Is there a way we can add onions and masala to this?? Thanks Anuja. Maybe you can prepare the okra fries first. Then in a small frying pan do some tempering, fry thinly sliced onions with masala of your choice. Switch off the stove once the onion is cooked mix the fries to the masala. I recently found your website and I visit it atleast once a day. Thank you for the many healthy and easy recipes. Thank you very much Sujatha. My son too ate almost everything. like mentioned earlier I fell for the look of the dish. Thanks for the recipe Madhuram. 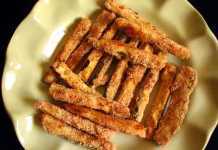 Just found your site and actually tried these okra fries. They came out really good and were devoured in minutes! Got to make a large batch again, thanks for such a wonderful, easy, savory recipe! Thank you very much RK for trying the fries and for taking the time to leave your comment. 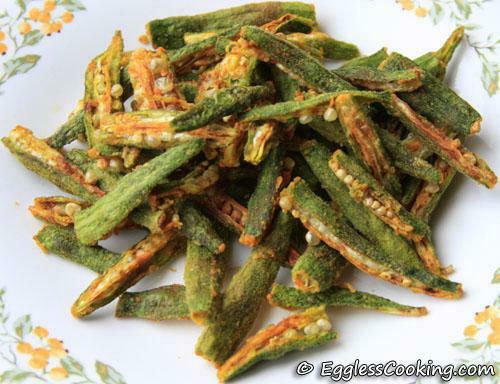 hye there,okra [bendi] has always been our fav,but never tried fried.thanks I’ll try soon. I too have reduced my mw use. These fries look really crispy! Fat free and microwaved – wow! Looks spicy and crunchy. Lovely pictures. How did I miss your blog for so long?! Will be back later to explore more.